We'll be holding the session via videoconference in our ReasonIO Free Conference Call online space - you can reach it here - and everybody is welcome to join in. It's at the usual time - 5 PM Central Time. I'll always give priority to people who actually have questions about Hegel's thought - and if you're reading Hegel, you're bound to have questions! I offer these sessions the general public as a public service to help build awareness and understanding of Hegel's philosophy. 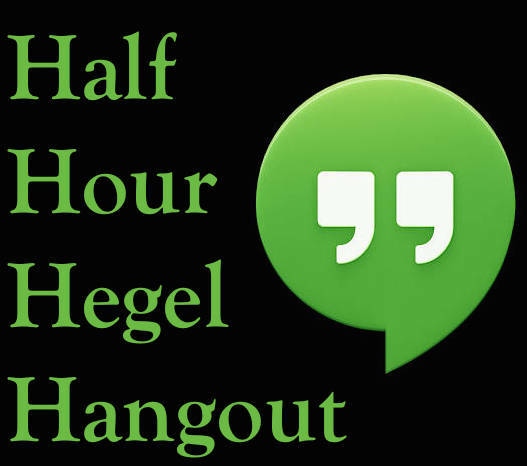 The Patreon supporters of the Half Hour Hegel project effectively underwrite this online engagement - so many thanks to them!